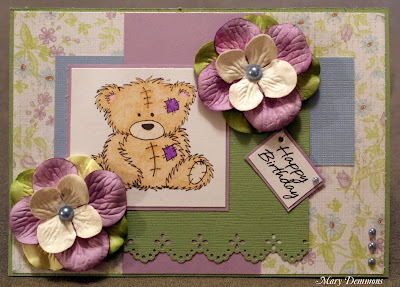 I created this birthday card using this adorable teddy bear digital stamp that my sister Stacy drew. Her online store, The Crafting Boutique, will be opening on April 1st. She will be selling digital stamps, handmade beaded stick pins and handmade paper roses. I colored the image using crayola and prisma colored pencils. The base of my card is lavender rosebuds patterned paper from Paper Pizzazz. I added three strips of cardstock behind my image, lavender, blue and green. I punched the bottom of the green strip using an eyelet lace border punch. I backed the image in lavender. I layered a green, purple and white paper flower on top of each other and added a blue pearl to the center. The sentiment that I added to my card actually hangs from the flower. I added a blue pearl to the corner of the sentiment and then three more to the bottom corner. So sweet! Lovely card Mary. :-) Thanks so much for playing this week's challenge at Digi Doodle Shop's Best! This is adorable Mary! That image is too cute!! Thanks so much for sharing with us this week at Penny's. Good Luck!! very cute! love the flowers! thanks for joining this weeks Bugaboo challenge at catch the bug! Cute. Thank you for joining us at Digi Doodle Shop's Best this week. So cute card! Love all the different colors you've used and those flowers are gorgeous! Thanks for joining us at Teddy Stampers this time. Very pretty! Love the image, layout design, and pretty papers! Thanks for playing with us at Paper Playtime! Another adorable card Mary!!! Love the bear and the soft colors you used!! Thanks for playing along at the Nook this week!! Such a pretty card Mary, love the flowers too, thanks for joining us at Digi doodle Shops Best. Simply adorable ted and a gorgeous card Mary. Thank you for joining Teddy Stampers. Beautiful card and that little bear is so adorable. Thanks for joining in the Meljen's Designs challenge this week. Beautiful card and love the soft pink! How super duper cute. Thanks for sharing with us at Teddy Stampers. Hope to see you again soon. How sweet:) Thanks for playing with MelJen's this week!